Contains one or more subdiagrams, or cases, of which only the enabled subdiagram executes. 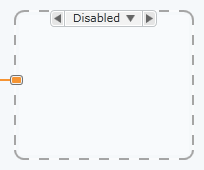 Use the Disable Structure to disable a section of the diagram. Part of the structure that displays the value(s) for which the associated subdiagram executes. You can also use the subdiagram selector label to set a default subdiagram. Select Edit Condition for Active Subdiagram in the Item tab to set one or more conditions that, when met, enables a subdiagram in the Disable Structure. For example, you might conditionally enable a subdiagram to run code only on a specific target. You can only access the symbols in the following table on a VI that is targeted to an FPGA. The location on either the FPGA target or the development computer running in simulation where the subdiagram executes. This is not a complete list of all valid FPGA symbols. When you select an FPGA target in SystemDesigner, the symbol values for that FPGA target are listed under the Compile Symbols section of the Item tab.